European gelato brand, Amorino, has brought the magic of authentic traditional Italian ice cream to The LINQ Promenade with the opening of its flagship U.S. location. Amorino, widely considered by Europeans to be one of the best gelato brands in existence and known for its unique flower-shaped gelato, certified vegan sorbets and all natural flavors, is located at the west end of the LINQ promenade by the Las Vegas Strip. The new 1,500-square-foot space accommodates up to 50 people and features a fireplace, sofas and other plush seating to provide comfort and respite to locals and tourists alike. Amorino never use coloring agents or artificial flavoring and offers gluten free and certified vegan options. Each ingredient is sourced from worldwide locales so they’re at their peak when used in the gelato recipe such as mango Alphonso from India, Bourbon vanilla from Madagascar, chocolate from Ecuador and Pistachio Bronte from Sicily. In every Amorino shop there is a fixed variety of 24 flavors as a well as a new and delicious seasonal flavors. Each Amorino store also offers authentic tasting decadent treats such as gelato filled macarons and artisanal chocolates. Patrons may also choose from a quality selection of breakfast pastries and a variety of beverages including coffee and real Italian espresso and cappuccino. Amorino Las Vegas is owned by Jeremy Decherchi and Nicolas Mouillon who also own and operate the Amorino located at the Las Vegas North Premium Outlets, 625 S. Grand Central Parkway. To celebrate their opening by giving back to the community, Amorino will launch a month-long icon donation drive benefitting the Make-A-Wish Foundation of Southern Nevada from August 25 through the end of September. Guests who visit either of the two gelato locations and donate at last $1 to the Make-A-Wish Foundation of Southern Nevada, will receive 10% off a gelato cone or cup sized classic or larger. Amorino at The LINQ Promenade is located at 3545 S. Las Vegas Blvd. Hours of operation are Sunday to Thursday, 8 a.m. – midnight; Friday to Saturday 8 a.m. – 1 a.m. For more information visit www.amorino.com. 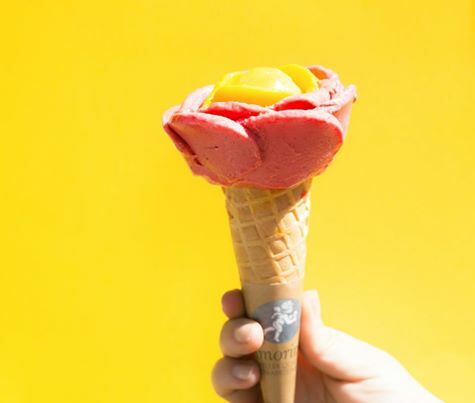 Amorino is known for their unique flower shaped cone, with unlimited flavors available on each creation. Each gelato recipe requires ingredients sourced from worldwide locales so they’re at their peak when used. Amorino doesn’t use any coloring agents or artificial flavoring and offers certified organic, gluten free and vegan options. Inside the shop you’ll find an assortment of traditional and seasonal flavors – think mango Alphonso from India, Bourbon vanilla from Madagascar, chocolate from Ecuador, and Pistachio Bronte from Sicily. The eatery also sells other decadent treats, including gelato-filled macarons, specialty coffee, crepes, waffles, hot cocoa and chocolates. Founded in 2002 by childhood friends Cristiano Sereni and Paolo Benassi, Amorino is known for its quality, consistency and flavor, which is achieved through the use of all-natural products. Amorino has a strong European following with 150 stores and is building steam in the U.S. with 15 locations now open. Amorino locations include Paris, London, Madrid, Milan, Lisbon, Dubai, New York City, Boston, Chicago, Los Angeles, San Francisco, Miami, Houston, Washington and Santa Monica.